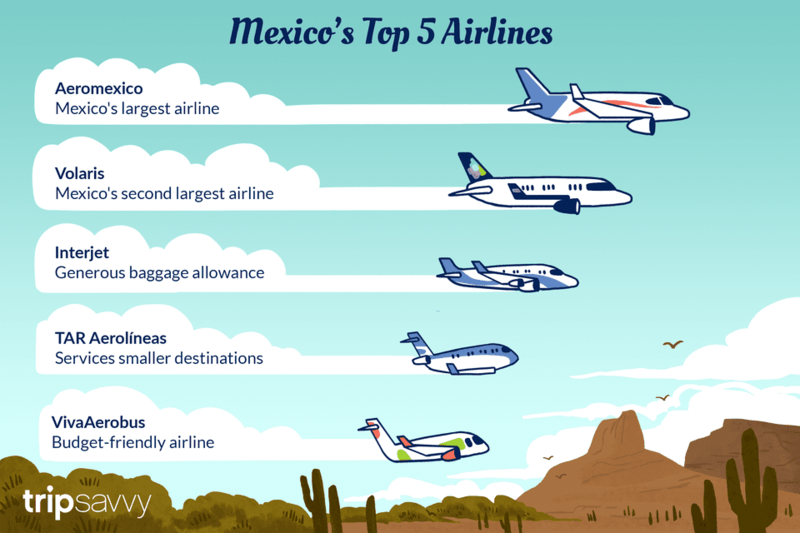 Travel by air in Mexico used to be prohibitively costly, but in recent years several low-cost airlines have emerged, creating stiff competition and offering travelers more economical alternatives as well as innovative services. Not all of these airlines are listed on travel aggregator sites, so you may need to visit each of their websites to compare rates and find the best deal. Here's a list of Mexico's airlines to look into when contemplating air travel in Mexico. Aeromexico is Mexico's largest airline and is based in Mexico City. This airline offers flights to many domestic destinations as well as to a variety of international destinations. AeroMexico is part of the SkyTeam Alliance, and its frequent flyer program is called Club Premiere. When booking AeroMexico flights through the company's website, you'll have the option to make a bid for an upgrade to business class. If there's space, your bid is accepted and you're charged for the amount of your bid, if not, there's no charge. Based in Mexico City, and operating out of both the Toluca and Mexico City airports, Interjet airline offers flights to over 30 Mexican destinations and to 12 international destinations as well. Interjet has a generous baggage allowance, allowing two checked bags and up to 50 kilos and one carry-on of up to 10 kilograms at no extra cost. Many of the planes in Interjet's fleet have a camera at the front of the fuselage and they display the takeoff and landing on screens so passengers can watch the action. Interjet's frequent flyer program, Club Interjet, gives 10% of the cost of your flight as a cash discount on a subsequent flight. Based in Monterrey, this low-cost airline operates flights to 27 Mexican destinations as well as a few destinations in the United States. Viva Aerobus is partially owned by the same company that owns Ryanair, and like its European counterpart, you can find some very good deals. When booking, you can choose between different tiers of service: Viva Light, Viva Regular and Viva Plus, so be aware that each of these tiers has different price and baggage allowance, and then there are several options, such as priority boarding that also affect the final price. In the past, VivaAerobus did not have assigned seats, and seating was on a first come, first served basis, but now the airline does offer the option of reserving a seat, for an additional cost. The newest comer onto the Mexican airline scene is TAR Aerolíneas. This airline is based in Queretaro and offers services to routes that are underserved by Mexico's other national airlines and providing non-stop service between some of the smaller Mexican airports. TAR started with a focus on the southeast region when it began operations in 2014, but has since expanded its service to include destinations as far-flung as Ciudad Juarez, La Paz, and Mérida, although is still only serving domestic destinations.